Our January blog posts show that we started the year in a very good mood as we had lots to celebrate. We finally moved into our 1920s vintage bungalow renovation and we completed our first 10 years in the antiques and home decor business. 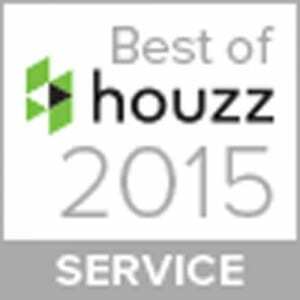 We also won a Best of Houzz 2015 award for Customer Satisfaction. That was the icing on the cake! Let’s revisit some of our favorite posts from the first month of what we hope will be a wonderful year for you, too! We started by looking back at our top 12 antiques and decor blog posts of 2014. It was hard to narrow down all the tours of customers’ homes, tips about antiques and decorating, and posts on travel and entertaining to just 12 favorites, but that was my task! I hope you agree and like them too. For example, the picture above was one of the most popular photos we shared on Facebook this year – everyone loved the antique French Renaissance buffet in our customer’s California kitchen. 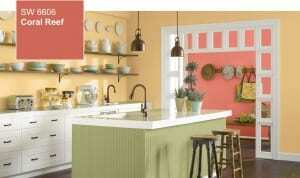 I was thinking a lot about wall paint colors this month. 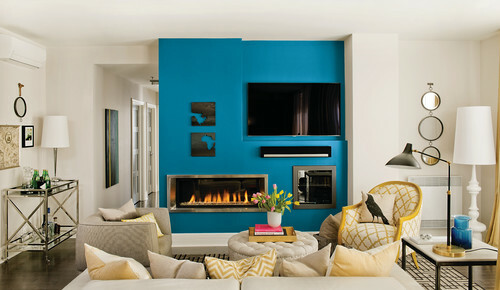 We always like to look at new decor trends at the beginning of the year, so we loved being inspired by the various Paint Colors of the Year for 2015. Some are pretty and fresh, some are dramatic and bold, but they are all fun to browse. Then we had to get down to business with our own 1920s vintage bungalow renovation project. 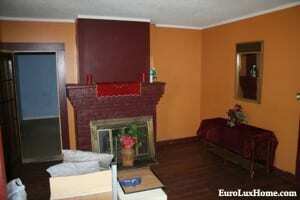 Our Vintage Life: Paint the Walls post showed how we made our house look like a home. The decorating included Greg’s creative touch to transform the original beaded board ceiling. 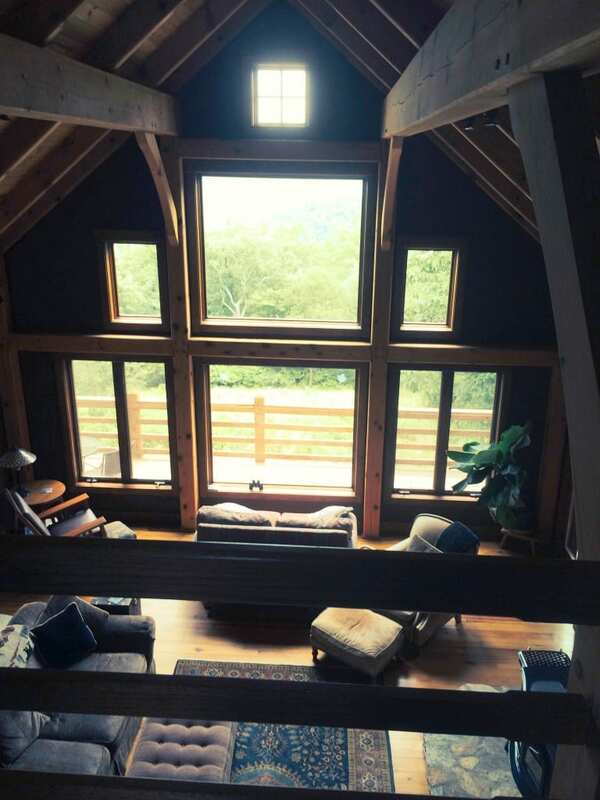 Finally, we had a wonderful tour of Melinda H.’s beautiful home in Black Mountain near Asheville, NC. We delivered a prettily carved small French Country cabinet to Melinda and she graciously gave us the full tour of her house. It features so many lovely details, you just have to see for yourself in the French Country Jam Cabinet Client Spotlight. I wasn’t sure how the first month of 2015 could have flown by so quickly. But now I look at how busy we’ve been, it’s not so surprising! I’ll be back with more blog posts on fine antiques for regular folks and other home decor inspirations in February. Let us know if there is a topic you would like me to cover. This entry was posted in Antique Furniture, News and tagged Antique Furniture, Antiques Blog, creative home decorating, interior decor, interior design, living with antiques, paint color on January 30, 2015 by admin. I’ve been browsing through Amazon.com’s list of the best books of 2014 in the Home and Garden category. I noticed how many of those books focus on the home as a place to express your unique personality. Each book approaches the subject in a different way, so let’s take a look at these ‘best books of 2014’ – they are all quite new as they were all published last fall. 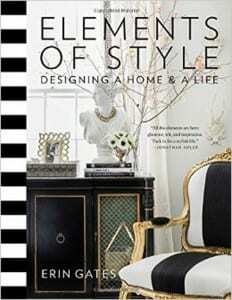 Written by Erin Gates, an interior designer, blogger, and magazine writer, Elements of Style is a practical guide to designing a home that reflects your personality and style. Gates believes that home design and decor is “an outlet of personal expression and an exercise in self-discovery.” We’d agree with that! The book looks at rooms in the author’s own home as well as in her clients’ homes. Gates is a candid and witty writer. India Hicks described the book as, “hugely refreshing” and she commented on “the undecoratorly way this book is written.” Sounds great to us! I love the title of this book. Every house has a story, doesn’t it? Just like the people in it. Bring the stories together and you can create a really wonderful space. 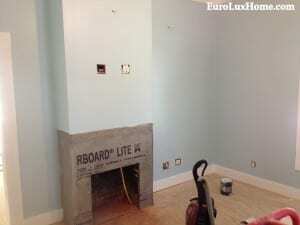 (This is what we’ve tried to do in our 1920s vintage bungalow renovation.) 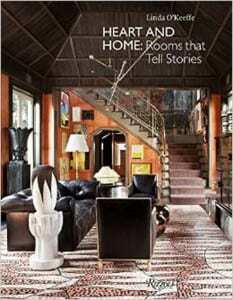 This book looks at the stories inside the homes of people known in the fields of interior design, architecture, fashion, and art. The rooms are decorated with character, originality, and personal meaning, from a New York loft in a 1920s factory building to an “Old Hollywood” estate in Beverly Hills. The author, design writer Linda O’Keeffe, was the creative director of Metropolitan Home magazine. 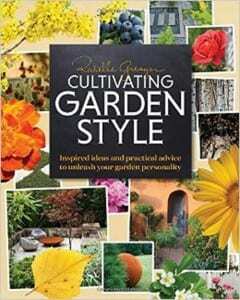 The full title of this tome is: Cultivating Garden Style: Inspired Ideas and Practical Advice to Unleash Your Garden Personality. I know it’s early to think about gardening for many of us across the country – some are still deep in snow season. But spring will be here soon! Gardening writer Rochelle Greayer helps everyone develop their inner garden designer with step-by-step projects and tips. The aim is to create charming, comfortable, and individual outdoor areas. The book features more than 1,500 color photographs to explain the 23 basic gardening styles that you can make your own. If you’ve read any of these home decor and garden “best books” of 2014, we’d love to hear what you think of them. Or perhaps you have your own nomination for the title? This entry was posted in Bookshelf and tagged books, decor, decorating books, design books, design inspiration, interior decor, interior decorating resources, interior design, interior design books, landscaping on January 27, 2015 by admin. 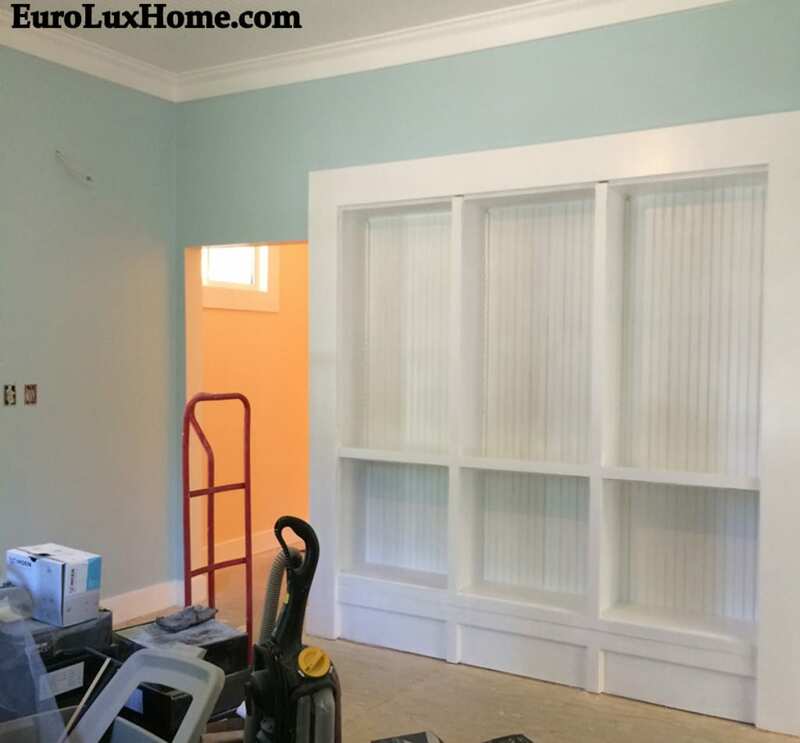 Greg and I were thrilled to hear that EuroLux Home is a winner in the Best of Houzz 2015 awards. We even get a special button to put on our website. How fancy is that? EuroLux Home was awarded “Best Of Houzz” for Customer Satisfaction. We pride ourselves on our customer service so that makes us very happy, especially as we were only invited to join the Houzz.com marketplace last summer – this is our EuroLuxHome page on Houzz. We received a press release from Houzz to distribute. I won’t take up my whole blog post by copying it all here, but this is the part about us. Out of curiosity, I looked at our recent best-selling furniture and home accents on Houzz. This gorgeous new Woodbridge cocktail or coffee table has been especially popular, both in this gold leaf finish and the alternative silver tone finish. 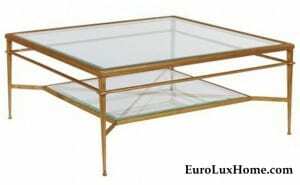 The square beveled glass cocktail table is crafted with a sturdy forged steel frame and a stunning antiqued gold leaf finish. Our previous client spotlight shows how chic the Woodbridge table looks in our customer Mary G’s Californian living room. We’ve also featured in several editorials on Houzz recently. I already mentioned the Games People Play article about family games. 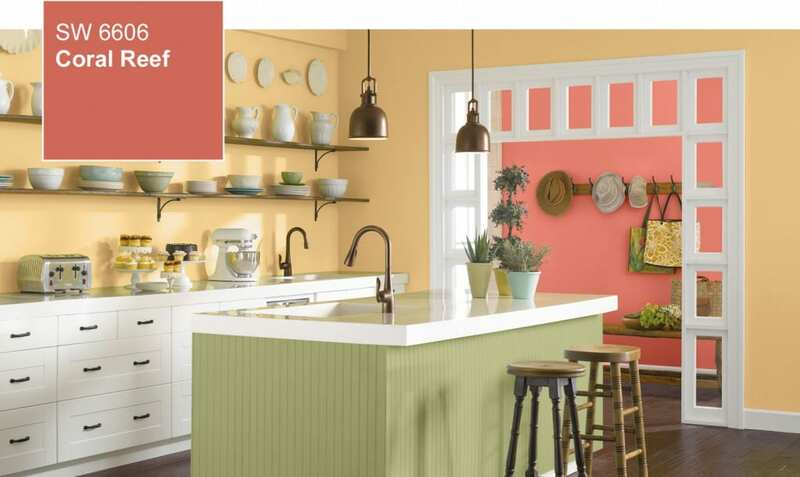 The other ones include the Houzz piece on Decorating Your Home With Coral Reef, the 2015 Sherman-Williams paint Color of the Year. 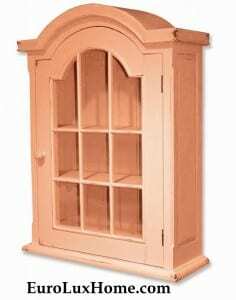 Houzz mentioned this handsome new cottage style hardwood coral pink painted cabinet that we sell. 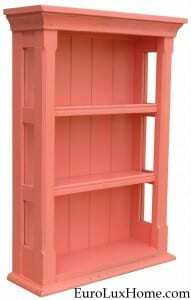 Funnily enough, I also wrote a blog post last week about the various 2015 Paint Colors of the Year and I suggested in that another coral pink painted wall cabinet by the same furniture maker. It would make a nice partner to this one! 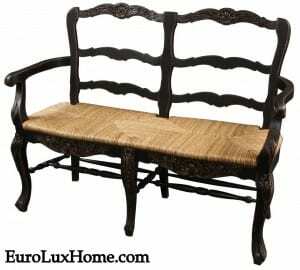 They featured this French Country settee, newly crafted with Old World appeal. 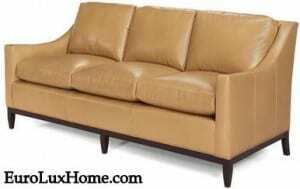 They also selected our luxurious new top grain leather sofa, hand-crafted in the USA with a solid wood frame. Thanks to all the Houzz editorial writers and the Houzz users and customers who have supported us with great reviews! If you haven’t joined Houzz yet, then of course you can still browse our full inventory at our own online site: EuroLuxHome.com. This entry was posted in News and tagged Antique Furniture, Antique Reproduction Furniture, high quality reproduction furniture, how to buy antiques on the internet, interior decorating websites, interior design websites on January 23, 2015 by admin. Vintage Life: Paint the Walls! creative touch Greg thought up. After the drywall went up, we decided to add a bit more character to the walls in the front living room as well as the master bathroom. 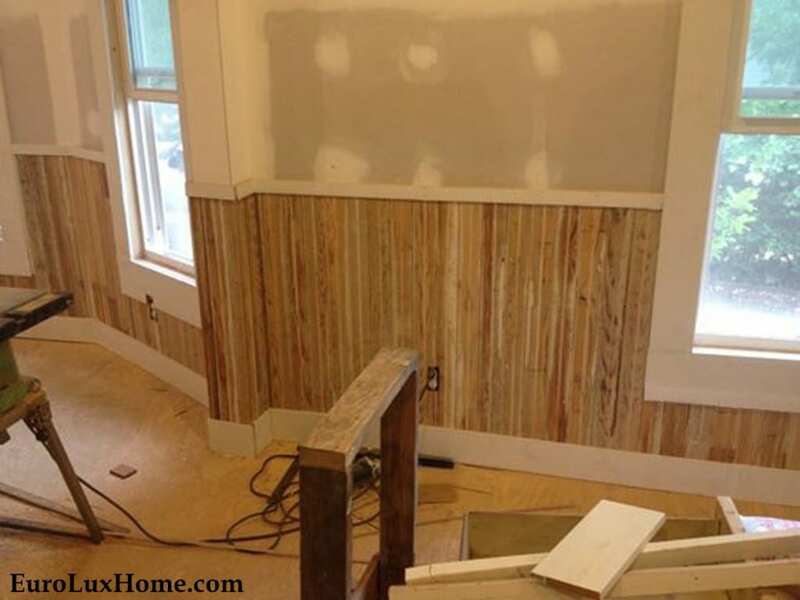 We created wainscoting from beaded board that was original to the house. You might remember that some of the ceilings had water damage and those areas had to be replaced with new beaded board. We cut out the bad spots from the original beaded board, planed it down to remove the paint, and then dovetailed it in place with the shoe molding and the chair rail trim. 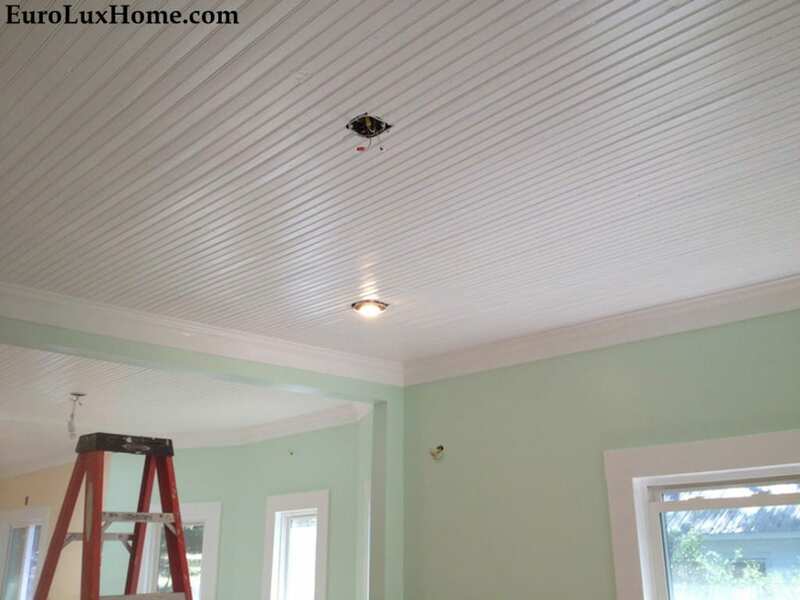 Here is a shot of the original beaded board ceiling after it was sanded down, caulked between every board, and then painted a fresh coat of bright white! It was very labor intensive, but we think the result is fabulous! 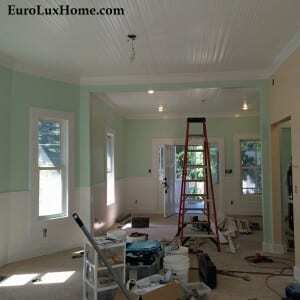 We have 10-foot beaded board ceilings throughout the whole house and most of it is original. You’ll notice we’ve chosen 1950s pastel colors throughout the house to keep with our vintage motif. The front living room is a pretty mint green that has a nice calming effect and it really sets off the beaded board wainscoting after it was sanded, caulked between each board and painted bright white. My living room is pretty close to Guilford Green, one of the paint colors of the year that I blogged about last week, but it is definitely more minty than silvery. 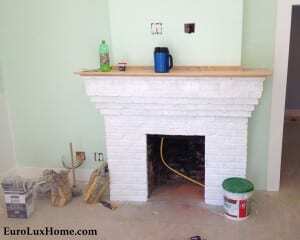 We also painted the original fireplace that had been painted dark maroon with orange walls and changed out the ugly front door with vintage Craftsman style door. For the kitchen and sun room at the back of the house, we chose a cheery, warm yellowish-peach color that seems to change throughout the day as the light changes. I have still have to replace the glass in the cabinet doors with seeded glass and paint the doors – it is on my very long to-do list! 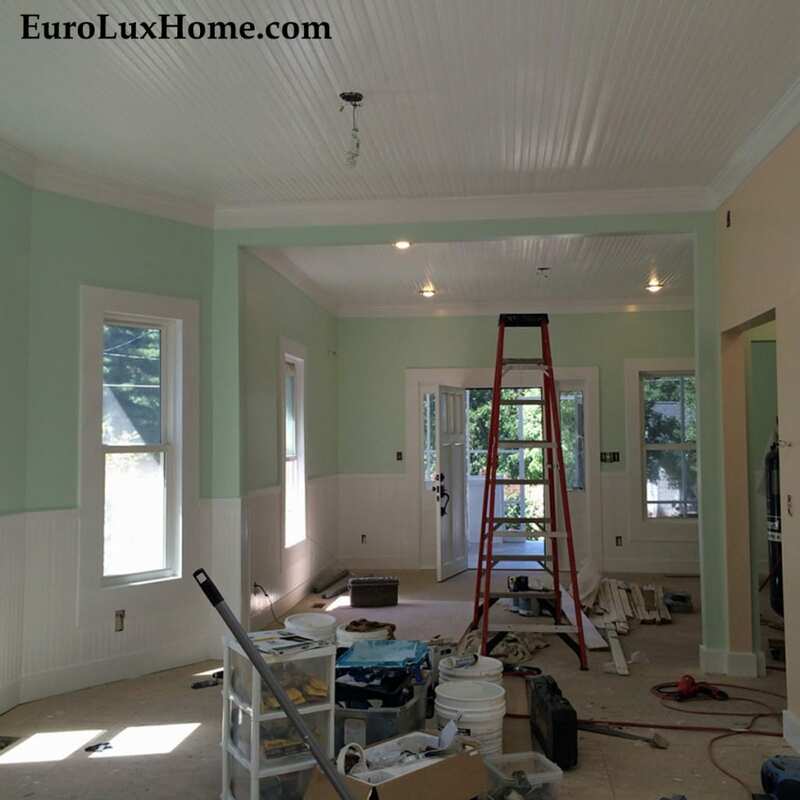 I’ll show you the paint colors in other rooms as we add vintage light fixtures throughout the whole house and start on the flooring. Till then, thanks for reading about our vintage bungalow adventures. What do you think of our decor so far? 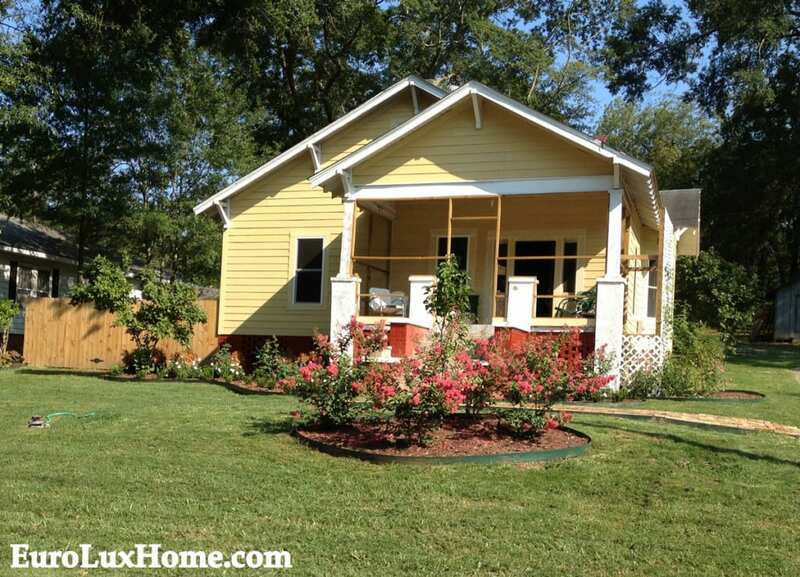 This entry was posted in Vintage Life: Our 1920s Bungalow and tagged 1920 Bungalow Renovation, 1920s bungalow remodel, creative home decorating, green decor, old house restoration, paint color, Vintage Life on January 21, 2015 by admin. 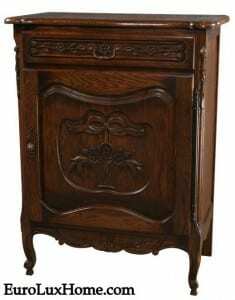 Melinda H. found us on Ebay and fell in love with our prettily carved small French Country cabinet. When we found out she had a home in Black Mountain, just outside of Asheville, NC, we jumped at the chance to deliver in person. We love that area and we discovered that Melinda’s house is amazing. This is the antique-inspired new French Country Cabinet that Melinda chose. It is crafted in solid oak wood with an antiqued finish. It’s really a jam cabinet or jelly cabinet of the type that was popular in early 19th century American homes. The French Country style cabinet (item BG-177 on our site) features detailed carving including a carved basket filled with flowers and tied with ribbon. The scalloped detail and curvy little legs add to the French Country style of the jam cabinet. It’s 39 inches high, so it’s a nice size for many rooms and many purposes. The French Country cabinet found its new home at the edge of Melinda’s kitchen, just under the clock. Melinda and her husband Richard have built a very beautiful home with incredible long-range views – it is no wonder they were featured in a magazine! Here’s a closer look at the French Country jam cabinet on the left. The breakfast nook enjoyed stunning views. It was hard to take good photos with so much light streaming in through the windows, but at least you get an idea. The chandelier is also the perfect accent. 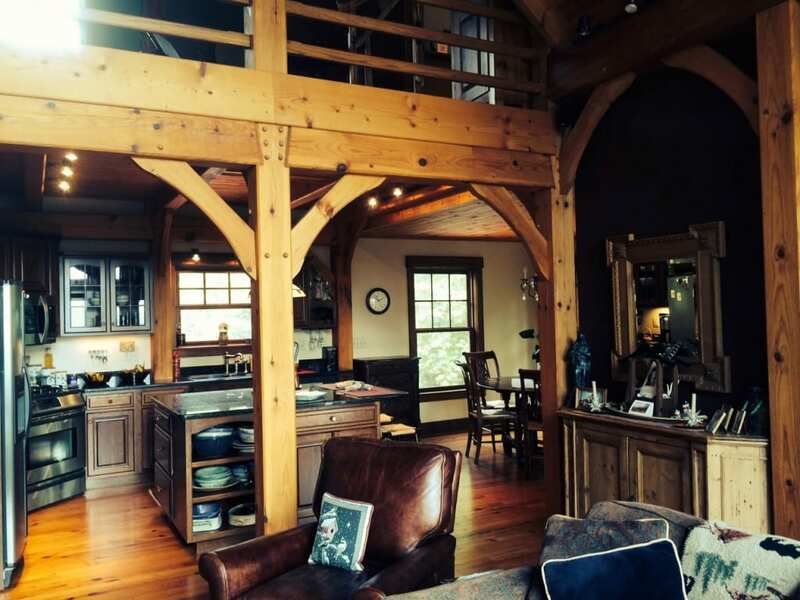 Melinda graciously indulged our fascination with home design and showed us around, even showing us the upstairs loft where she and Richard indulge their passion – playing Celtic music together. 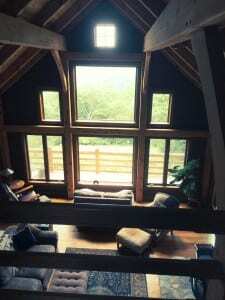 What a great view from the loft! The space manages to be both cozy and panoramic. 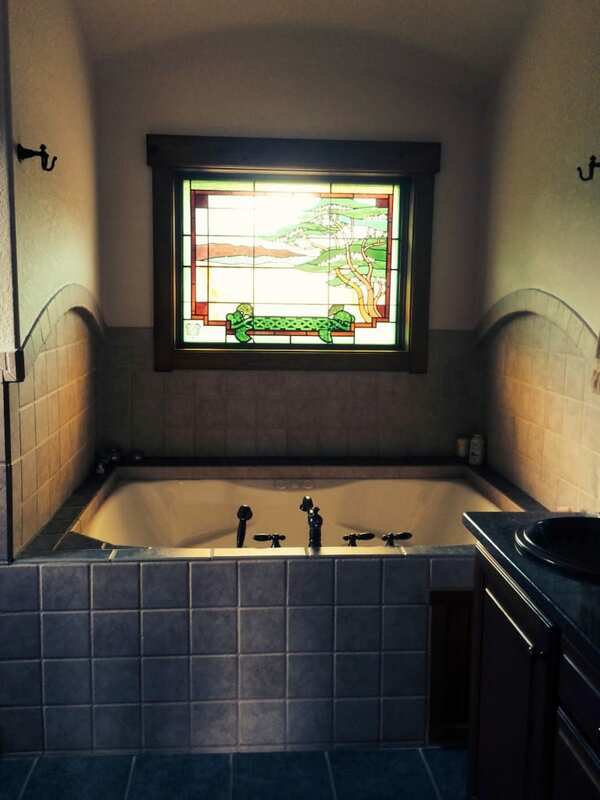 I absolutely loved the custom-made stained glass panel featured above the large soaking tub in the master bathroom. The detail on the stained glass panel is exquisite, and the green colors so vibrant. 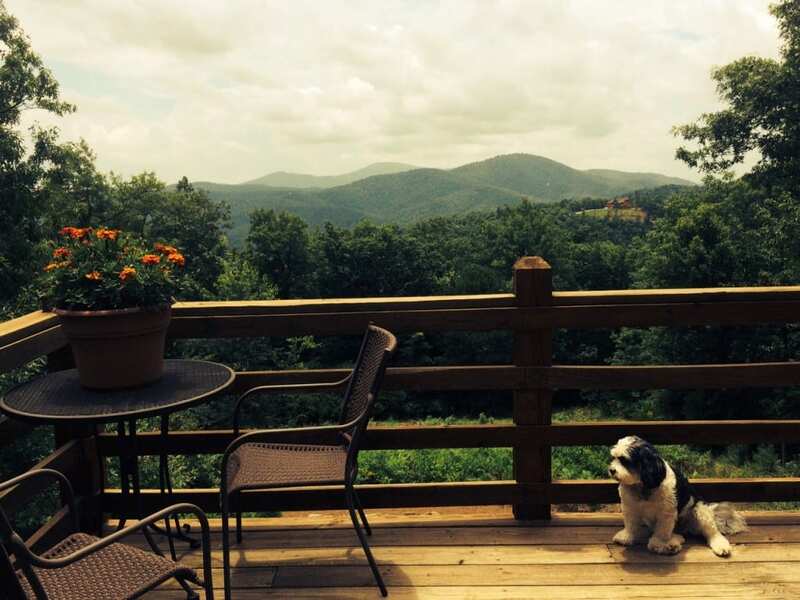 We’re envious of the view that Melinda and Richard’s little dog sees from the back porch. What a lucky dog! We love the Asheville area, as regular readers know from our stories about antiquing in Asheville. We even have our own booth now at the Antique Tobacco Barn. So it was terrific to have a chance to deliver to Melinda’s house ourselves. Greg and I found Black Mountain so charming that we went back for a few days of vacation. 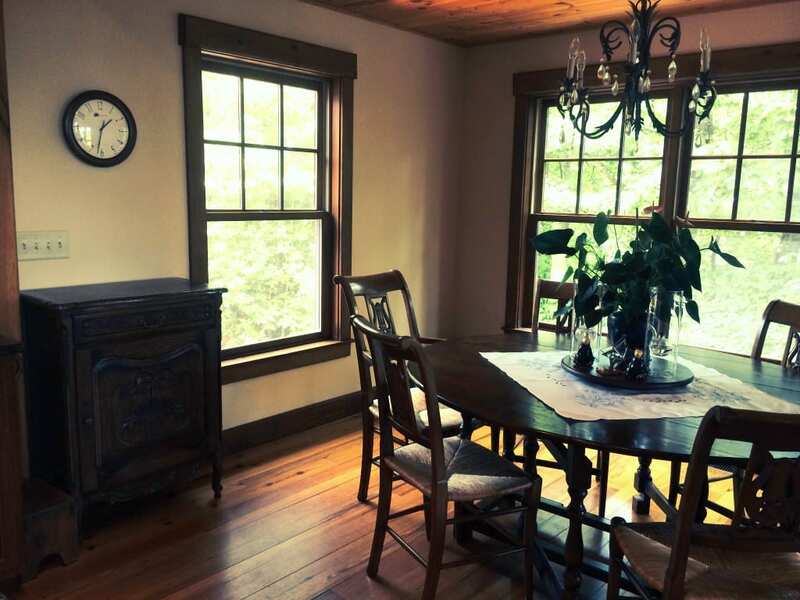 Thanks Melinda for sharing photos of your lovely home – we hope you enjoy the French Country cabinet for many years to come! 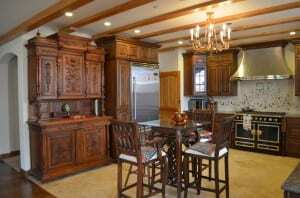 This entry was posted in Client Spotlight and tagged antique inspired furniture, dining room, French Country, French Country cabinet, high quality reproduction furniture, Jam cabinet, kitchen, reproduction furniture on January 12, 2015 by admin. Last week I gave you a summary of six of our most popular antiques and home decor blog posts of 2014. Here’s Part 2 with the remaining six of our (and your) favorite 12 posts. It’s hard to choose just a few out of a whole year of tips about antiques and home decor, but we hope you enjoy these. Happy new year! 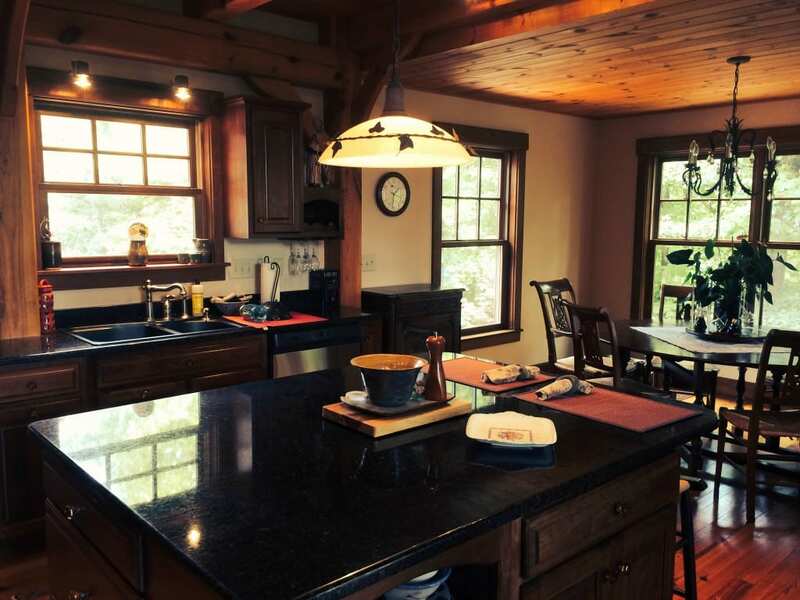 In our series of client spotlights showing our customers’ homes, I loved writing about Bob H.’s amazing French Renaissance castle style home in Illinois. 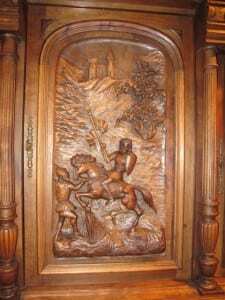 Bob bought a set of antique Renaissance chairs from us and also an antique Renaissance buffet with a carving of a knight on horseback before a chateau. Bob was so inspired by the knight carving that he had artists create a big wall mural of the same image, and then a stained glass window too. 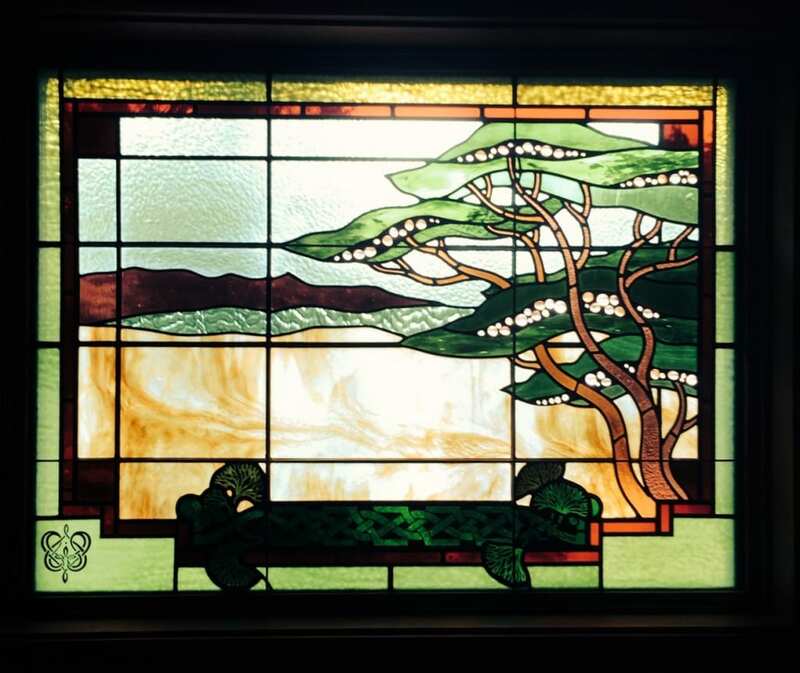 Check out the full post to see the mural and the beautiful window overlooking the armor in Bob’s large foyer! Cathy B. showed us before and after photos of her game room renovation in the basement of her home on the Guadalupe River in Canyon Lake, TX. She called the pub-style bar space her “dream game room basement” and she even moved the outside staircase so it didn’t obstruct the river view. As you’ll see in the Game Room Renovation post photo tour, Cathy bought a new Ambella Home vanity from us featuring a marble top and copper farmhouse sink – it looked perfect! Our most exciting news in 2014 was that after several years of renovating our 1920s vintage bungalow, Greg and I finally moved into it just before Thanksgiving! Thanks for all the congratulations from blog readers who have followed our Vintage Life Bungalow Renovation stories since we bought the bungalow (a.k.a. The Money Pit) in 2011. 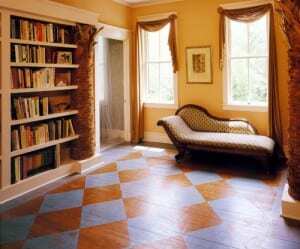 I posted about Classic Painted Floor Designs as part of our series of ideas about creative home decor that gives a fresh look to a room but still has traditional appeal. The ideas ranged from stripes and stencils to checkerboards and chevrons. I shared tips on how to get the painted floor looks, too! 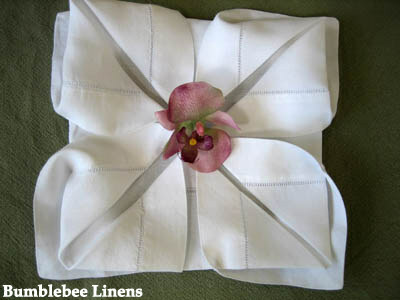 My post on Romantic Napkin Folding got a lot of shares and likes on social media. 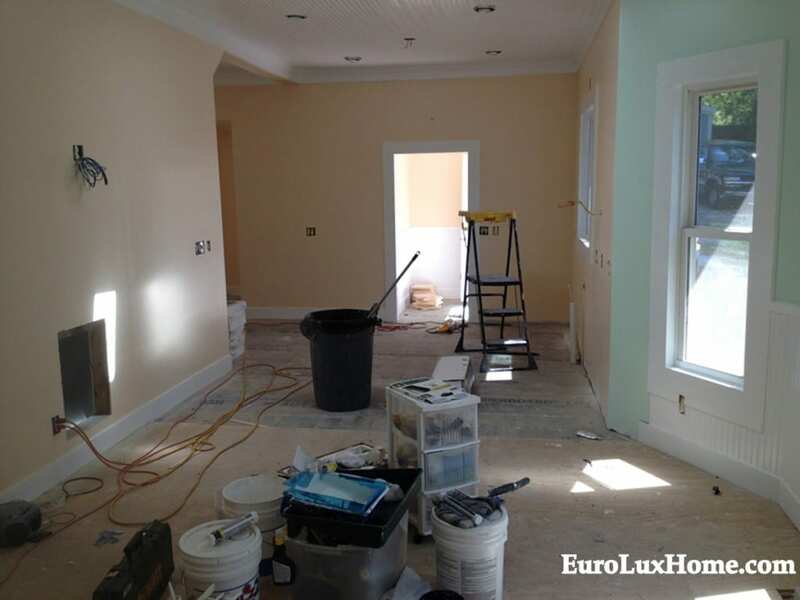 (EuroLux Home is on Facebook, Twitter, Google+, and Pinterest.) People seemed to like the traditional appeal of these charming ideas, so I guess that elegant entertaining never goes out of style! The post was timed for Valentine’s Day but hey, we can indulge in our inner romantic any time of year, can’t we? We want to enjoy the antiques lifestyle in every way, so I also like writing about travel to historic houses and hotels and antiques-themed destinations. Anyone who knows me and Greg knows that we love to go antiquing in Asheville, NC. We’ve even just taken a booth there at the wonderful Antique Tobacco Barn. 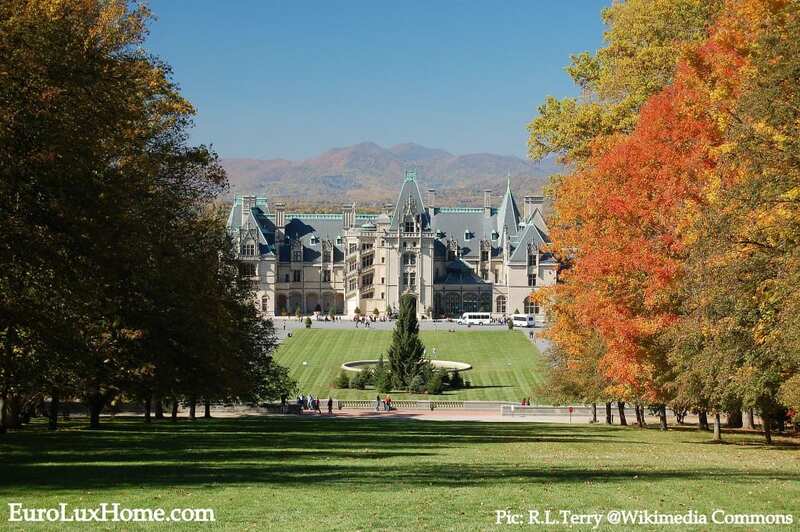 So it’s no surprise that my post on the Biltmore House and Gardens Estate in Asheville was a stand-out travel post in 2014! The photos of this National Historic Landmark are wonderful and you can even stay at the Inn. 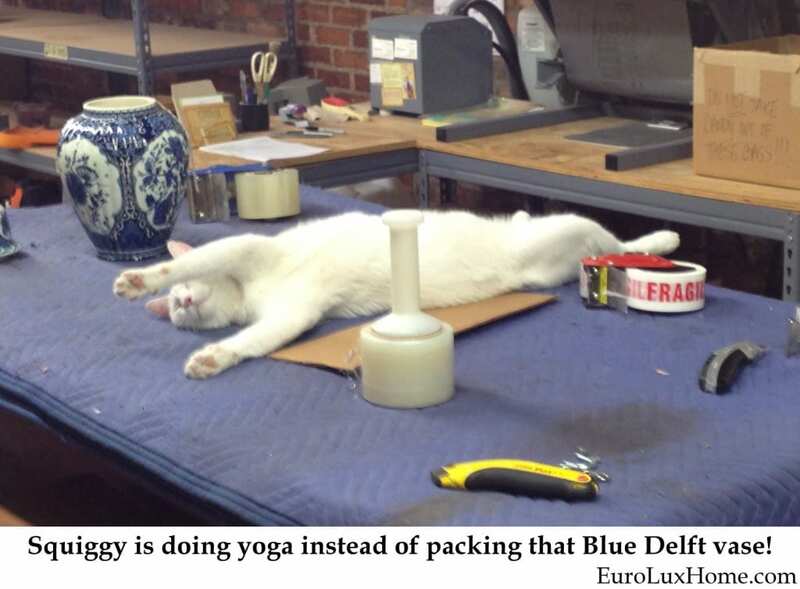 Finally, I have to share one last photo with you to show you the kind of hard work that goes on behind the scenes here at EuroLuxHome.com … Is it Upward Facing Cat pose? We posted this picture (and many others of antiques and home decor, as well as photos of our 8 cats and dogs who ‘help’ us in the gallery) on our EuroLux Facebook Page. Our fuzzy friends just LOVE the attention! That’s it for our recap of our top 12 blog posts of 2014. If you missed the first six in Part 1, you can see them here. I’ll be back with new antiques and home decor posts soon to help us all live a delightfully decorated 2015! This entry was posted in Antique Furniture, Home Design Ideas and tagged Antique Furniture, Antiques Blog, interior decor, interior design, living with antiques on January 5, 2015 by admin.